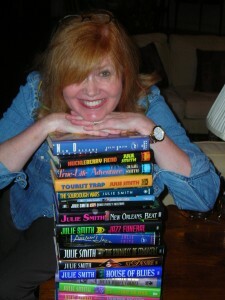 Julie Smith is the author of 20 novels, most of them set in New Orleans and starring one or the other of her detective heroes, an ex-debutante turned cop named Skip Langdon, and a PI named Talba Wallis. (Both female, both tough and wily.) A long-time New Orleans resident, she’s the editor of the recent, highly acclaimed anthology, New Orleans Noir, and she’s also written numerous short stories and essays. Her novel, New Orleans Mourning, won the Edgar Allan Poe award for best novel. This well-known creator of the detectives Skip Langdon and Talba Wallace recently turned her hand to a different kind of character, an engaging one at that, a cat. He’s named A.B., advisor to budding psychic Reeno, ace teen burglar, tough and wiley like Julie’s other female protagonists, just younger. Taking a cue from all of the research for her long series of mystery novels for adults, Reeno is a well-drawn crime figure who describes her friend A. B. as the “mutant cat from Hell.” The book, Cursebusters, is a YA paranormal adventure. After editing New Orleans Noir, she created an e-publishing company, which launched in 2010 with a book by Patty Friedmann. She has published numerous books since then. Julie, who also has been a writing coach, is author of Writing Your Way, a no-nonsense, jam-packed book on writing fiction. The book came directly out of the author’s belief that most writing teachers need to cut their students a little slack. Her approach is to help you find your own writing method. 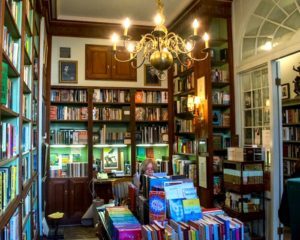 And, as a result of her own explorations for e-publishing, she also has posted a blog dealing with The Secret i-Book Strategy. “Here’s the great thing about i-Books,” says Julie, “you can actually watch little movies in your book—right on your I-Pad or phone–like Harry Potter and his buddies did in the Hogwarts library. Also, the pages turn just like real ones.” Find out more about Julie and her work at her three, yes, three web sites: http//www.booksBnimble.com, http://cursebustersbook.com/, and http://www.casamysterioso.com. She also blogs, Facebooks, and she, we assume, tweets up a storm, a totally modern Millie of a writer!